Gentle enough for sensitive stomachs. Number 1 doctor recommended brand (among stimulant laxatives). Women's gentle laxative. Dependable overnight relief. Easy-to-swallow, comfort coated Dulcolax Tablets are gentle enough for sensitive stomachs, yet strong enough for effective overnight relief. Trust Dulcolax Tablets to relieve constipation in 6 to 12 hours. 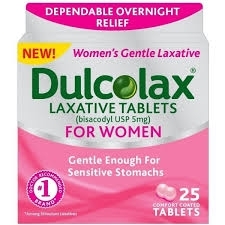 Dulcolax Tablets are convenient to use overnight, or whenever you need effective relief from constipation. Take with a glass of water. Adults and Children 12 Years and Over: 1 to 3 tablets in a single daily dose. Children 6 to Under 12 Years of Age: 1 tablet in a single daily dose. Children Under 6 Years of Age: Ask a doctor.